It’s a statement that I proudly declare every year as it begins to get cold. But I’ve been straight up lying to myself! I don’t love the dark mornings and even darker nights. Or trying to muster up the mental strength to get out of my car or even walk the dog! But I do love the things associated with this chilly season… hot chocolate, movie nights, cozy blankets, and of course winter fashion! So let’s get right to it, how the pros stay warm during the winter months (and how you should too). An effective layering system is the key to staying comfortable throughout these notoriously cold Wisconsin winters. Everyone feels the cold differently, for example, I’m a freeze baby and am cold even on 70 degree days but then I walk outside and see people in shorts when it’s a whopping 14 degrees outside! Luckily a basic layering system will work for everyone. 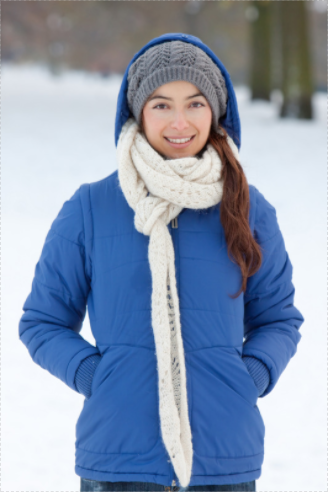 A base layer is your first line of defense against the cold. Base layers are designed to regulate your body temperature and should be close fitting to trap a thin layer of warm air against your skin. A base layer will also ‘wick’ away perspiration from the skin to keep you dry. Why is being dry so important? Because dry = warm. When it comes to base layers, read the tags! You’re looking for something that says Merino wool or Polyester. STAY AWAY FROM COTTON! Cotton holds moisture, therefore, you’re cold and crabby. Merino wool is popular as it’s naturally warm and has antibacterial qualities. Goodbye B.O.! Despite what you may have thought of wool in the past, merino wool is not itchy! So don’t let that scare you away, you’ll stay warm, dry, and itch free. I promise! Merino is your answer if you’re a freeze baby like I am, going hunting, going to a Packer Game, or doing something where you’re not working up a sweat. Polyester isn’t the warmest base layer but it’s great if you’re planning on being more active because it adjusts to the wearer’s heat and humidity. Walking the dog? Cutting wood? Ice Skating? Throw on your polyester base layer. 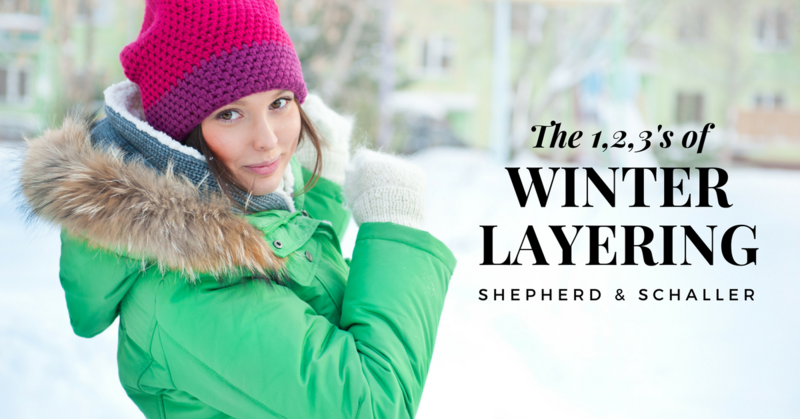 2) Mid layers – aka my favorite layer! Just because you want to stay warm, doesn’t mean you have to look sporty all the time. Dress your mid layer up or down as much as you want! An effective mid layer will provide great insulation by working hand in hand with your base layer to trap air between layers, resulting in enhanced warmth and comfort. Fleece is the ideal mid layer, as it is lightweight and highly breathable. Warmth without weight is important otherwise we feel super restricted and no one wants that. It’s all about comfort, right? You don’t have to go out and buy a special mid layer either. Do you have a wool sweater in your closet? Maybe a cute down vest? Just don’t put the cotton shirt underneath it! The outer layer is just like the windows in your house. You may have the best heating system in the neighborhood but if you’re by a window you’ll still get that unwelcoming chill. So naturally, what do you do? Shut the window curtain, right? It’s that one extra layer that helps keep the cold outside, where it belongs! Just think of the curtains being like your jacket. You can have the best jacket and snow pant in the world but they won’t do anything if you aren’t properly layered underneath, just like closing the curtain won’t keep you warm if you don’t have the furnace on. The base and mid layers wick away moisture and trap body heat while the outer layer is your main defense against the brutal Wisconsin elements. This snowproof, waterproof, and windproof layer is a lifesaver during those below zero windchill days! If you’re a freeze baby like I am, look for an insulated jacket and snow pant. This gives you one more layer of extra warmth. If you’re more active or are that person that wears shorts all year round, think about getting a shell. They have a similar feel to a rain jacket so they don’t give you extra insulation but they do protect you from the outside elements. 4) Don’t forget to accessorize! Listen to your mom! Cover your head, neck, and hands, it makes a world of a difference. And there you have it, the 411 on how to survive the winter months that seem to last a lifetime in the midwest. 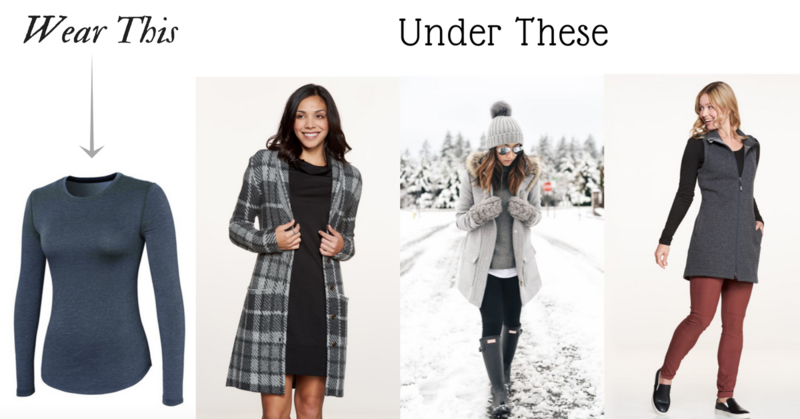 Click Here to shop some of our favorite layering pieces this season!